Often, I am asked by my friends to come with them to help pick out their new cell phones. It’s usually been almost two years since their last phone, and a lot has changed in two years. Partly because I am mobile-technology savvy and partly because I’m just a big nerd who takes great pains to stay up to date in that department, I can usually be of service. The first thing I tell anyone who asks (because it is always the first thing I am asked) is NOT to get an iPhone. I’ve been asked so many times and had to explain so many times that it seems more prudent to just write it down for all to see. Before the criticism begins, allow me to give credit where credit is due. The iPhone is a good product. In terms of functionality, user-friendliness, vision, and implementation, the iPhone (especially the iPhone 4S) is ideal for many people. But, as Samsung has recently tried to point out through their Galaxy ad campaign, it is by no means the only thing out there. In fact, the biggest reason that Apple is such a powerhouse today is only because they were first out of the gate, releasing the first iPhone in July 2007, over a year before the first Android device (HTC’s G1) was released. Since the G1 it’s been an ugly battle, with both companies viciously competing for market share and driving the technology in the field to dizzying new heights. Despite Apple’s significant lead (a year is a lifetime in the smartphone industry), Android has taken massive strides to catch up and surpass Apple in almost every respect. So before you run out the door to buy your new iPhone, consider a few things first. Put simply, anyone can do anything with their Android phone. In contrast, the user can’t even take the battery out of the iPhone. This represents a stark contrast in company philosophy. Android is an open source code. The developer codes for Android software are available for free to anyone who cares to mess with it. You can “unlock” your Android phone and rewrite the very code that it runs on to make it do what you want it to. This is far more advanced than the average user is capable of, but there are plenty of people out there who love doing exactly this, and they make the results of their work available for free to the rest of us on the Android platform. Apple, on the other hand, charges $99/year for access to their code, and developers can do only one thing with it: create apps for the Apple AppStore. Any attempt to rewrite the iPhone code would be immediately rejected, and those caught modifying and distributing modified codes would be prosecuted. In the long run, it is this philosophy that will be the death knell for iPhone. There is an active community of thousands of Android enthusiasts working tirelessly to make the platform the very best that it can be. The open source nature of Android encourages this. Apple retains such tight control over every aspect of its product that it simply cannot utilize the resources of the developer community in the same way that Android can. 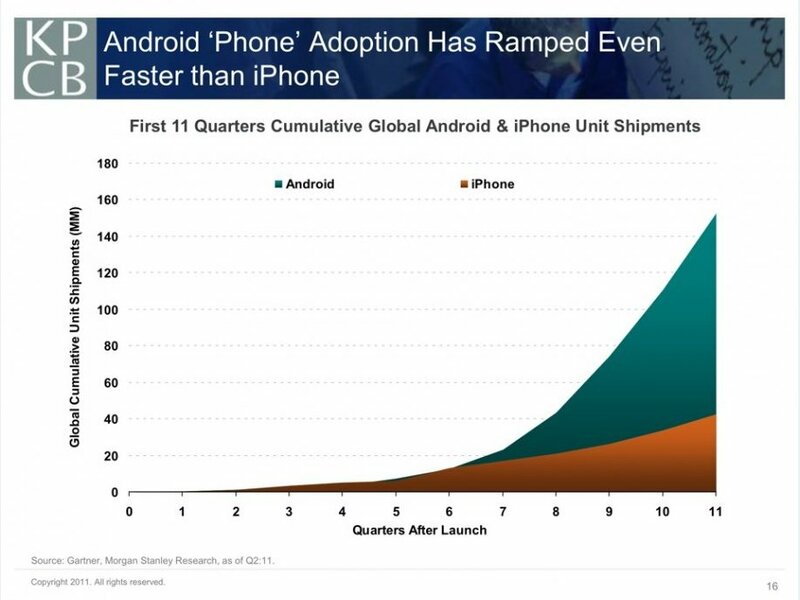 This point is perfectly represented by the graph below, comparing the number of iPhones shipped to the number of Android phones shipped. Now that the techy part is over, it’s time to discuss what everyone with a smartphone really cares about- apps! While true that the Apple AppStore still contains more apps than the Android Marketplace (459,000 to 319,000 as of October 2011) there are three things to keep in mind here. (1) Apple has a 16-month head start on Android. Considering that in just the last three months of 2011 there were over 100,000 apps added to each platform, 16 months is a tremendous lead, and for Android to close the gap this quickly is an impressive feat. (2) Android is catching up fast. October’s numbers were the latest exact figures available, but Android boasts on its website that the Marketplace now contains over 400,000 apps, and Apple claims to have over 500,000. Regardless of claims and speculations, one thing is clear- Android is catching up. Also keep in mind that because of the open source nature of Android, apps can be downloaded from other sources as well, including the Amazon AppStore, the AppBrain market, AppPlanet, and countless others. Including these third party sources, Android far surpasses Apple in sheer numbers of apps. (3) Android offers far more free apps than Apple. In fact, 70% of Android apps are free, compared with a mere 35% of Apple apps. From a developer standpoint, this could be a disappointment, but for the end user it is extremely satisfying to know that you got the same app for free that your iPhone carrying friends coughed up anywhere from $3-$5 or even more. There is one final, crucial aspect to consider when purchasing your new phone, and that is the hardware and software it is running. In this area, Apple at least gets kudos for keeping things simple and reliable. There is only one iPhone every year, and it comes straight from Apple. Every new iPhone is guaranteed to feature significant improvements over the previous generation of iPhone. Not so with Android. Android manufacturers have recently stated that beginning this year they will focus on quality rather than quantity and most all agree this is a welcome trend. For the last two years Android handsets have been flooding the market faster than anyone could keep up with them. The high-end and some mid-range Android phones have always been superior to iPhone (and any other phone on the market), but the low-end and certain other mid-range phones have tarnished the platform and left many consumers feeling that deciding which Android phone to get is just too much trouble. Many simply believe all Android devices are the same. In order to give an accurate comparison, we will focus only on the high-end phones (generally called “flagship devices”) of the various carriers, which represent the best of Android, and compare them to the iPhone 4S, the best of Apple. Motorola uses the slogan “Droid Does” in their marketing campaigns. This accurately sums up the difference between Android and Apple devices. Android does, and Apple does not. What does Apple not do? Several things, including but not limited to- NFC chips (Near Field Communication, used for such services as mobile banking), AM/FM radio; widgets (extensions of apps that update automatically on the phone’s home screen), 4G network speeds (that’s right- the iPhone 4 and iPhone 4S are NOT 4G phones), and memory cards/SD cards/SIM cards. Despite lacking several software features found in nearly every Android phone, the iPhone 4S falls short in the hardware department too. Without getting overly technical, the biggest problem with the iPhone’s hardware is that it is outdated and overpriced. The just-released iPhone 4S is powered by a 1Ghz dual-core processor, the Apple A5. The Apple A5 chip is based on Cortex 9 technology, which is almost three years old. Samsung has been able to use Cortex 9 technology to produce 1.5Ghz processors, so the question remains why Apple chose not to utilize the technology to its full capability. Even the upcoming iPhone 5 with an updated Apple A6 processor is based on Cortex 9 and expected to run at only around 1.2Ghz, while Samsung’s highly anticipated Galaxy S3 is expected to be running on Cortex 15 technology, boosting performance to 2Ghz and providing up to 75% more speed and power than Cortex 9-based chips. Even with inferior hardware, the iPhone 4S retails at $400, and that is WITH a 2 year contract. In contrast, flagship devices from LG, Motorola, Samsung, and HTC (the major Android manufacturers) have never topped $299, and most go for $199. The other major disappointment is that the iPhone 5 will not be a quad-core device, meaning Apple users will have to wait at least another full year before they can hope to see a quad-core iPhone. For those who don’t know, dual core devices were introduced for the first time last year (making their debut on Android, incidentally) and provided twice the speed, computing, and processing power of any handset released prior. Dual core has now become the industry standard. Quad core devices take it still further, promising a 5x performance improvement over dual core, essentially making mobile devices capable of running at speeds equal to or faster than a desktop PC with high-speed internet access. Quad core technology is already in use in some Android tablets, and at the Mobile World Congress at the end of February, quad core phones will be premiered for the first time, yet again exclusively on Android. In the last three years, Android has come from being the dark horse of the mobile arena to the fore runner. In the coming years Android’s expertise and superiority will only become more pronounced as they continue to deliver cutting edge technology with the best hardware and software at the best prices on the market. Unfortunately for Apple, their reign of smartphone dominance is already on the decline, and they will continue to be outpaced and outdone as Android delivers what consumers expect out of their products.